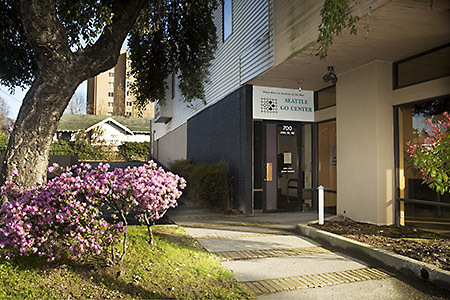 The Go Center is located next to the NE 45th St Exit of Interstate 5. The same exit is used for the University of Washington. From Downtown Seattle, take I-5 North, go over the Ship Canal on a high bridge, and then exit for 45th Street (Exit 169). Keep to the right side of the exit. As you approach the traffic light, select the left lane. Go straight across 45th when the light allows. Turn right into the parking lot, about 60 ft. from the corner. Parking is free when you check in at the Go Center – the day manager will give you a pass for your car. From North Seattle, drive south on I-5, and then exit for 45th Street (Exit 169). Turn left at 45th St and go over the I-5 bridge. Get in the left lane, and take a left on 7th Ave. NE, just after the bridge. As you turn onto 7th Ave, keep to the right lane of 7th. Turn right into the parking lot, about 60 ft. from the corner. (The north entrance to I-5 will be on your left as you right turn into the parking lot.) Parking is free when you check in at the Go Center – the day manager will give you a pass for your car. Parking Lot Update: In the daytime, from Monday to Saturday, we have only 10 parking spaces, which are located on the north side of the lot, and identified with signs. Some of those 10 spaces are shared with Companion Pet Clinic. We have the whole lot after 6:00 p.m. on weekdays, after 3:00 p.m. on Saturday, and all day Sunday. We also have the whole lot on the last Saturday of each month. Other Parking Options include two Diamond Parking lots that are two blocks east of our building. One is across from the Metro Cinemas on 9th Ave NE at NE 45th St, and the other is north of the movie theater. Daytime parking costs $5 for 10 hours. There is also a lot across 45th St from the Go Center, which has the same rates. It is close, but you have to wait for three cross walks to get to the Go Center. 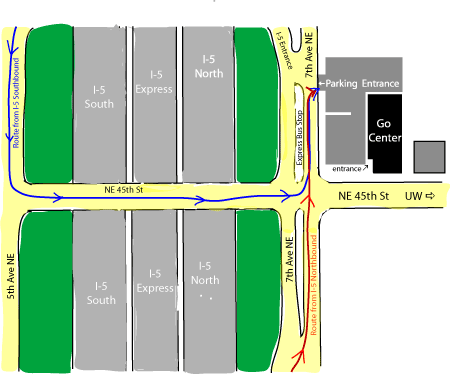 Hot Tip For Saturdays: there is free all day street parking on the west side of 7th Ave NE, north of the entrance to I-5. This area is reserved for buses on weekdays, but it is available on Saturdays and Sundays. Most other daytime street parking in our area has a two hour limit. 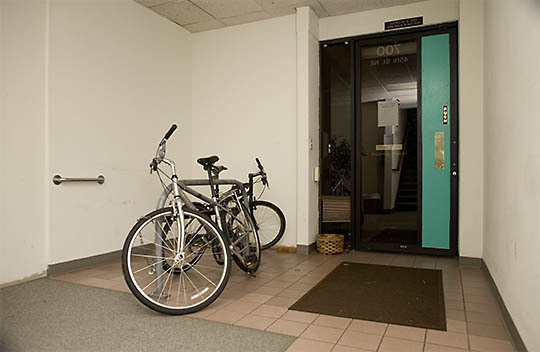 Bicyclists may lock their bikes on the racks inside the building in the lobby area. There are places for three bikes. Bus Riders should note that we are next to a northbound express stop for I-5. The matching southbound express stop is reached by crossing the 45th St. bridge over I-5. The entrance to the Go Center is next to the parking lot, near the front of the building. Just go up the stairs to reach the Center, which occupies the entire 2nd floor. We also have an elevator on the right side of the lobby. 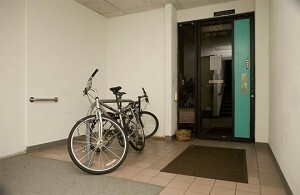 We have a bicycle rack inside the front door.